Kitchen Work Tops are a big part of your kitchen, You have the choice of many materials and finishes, we can advise you on the durability and maintanance required whether it is a timber work top or stone work top. A kitchen can be transformed from a laminate work top and up graded to a solid surface work surface, this could be anything from Man made quartz to Natural Granite work surface, or for a more Minimal look you could look at Corian Work surface which is a totaly seamless product and lends itself to a very modern look. Laminate worktops are a favourite of our customers and offer a blend of style and practicability, suitable for a wide range of kitchen environments from traditional to contemporary. If you are only looking to freshen up your kitchen design, you will find that a new worktop can make a huge difference and can totally change the feel of your existing design. 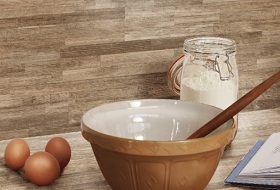 Laminate kitchen worktops consist of a laminate coating over the wood. One the main advantages of laminate worktops simply has to be the huge number of different designs that are available to choose from. Laminate kitchen worktops can replicate the effect of granite, wood and many other natural materials. 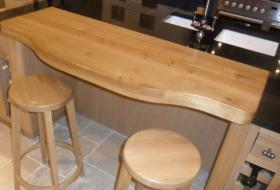 Solid wood kitchen work surfaces are suitable for traditional to contemporary kitchens. With a solid wood worktop your kitchen will be unique as no two pieces of wood are the same. It will be solid and tough, easy to live and work with, warm to the touch and durable. Whether you choose a light wood like Maple, or a rugged traditional wood like European Oak you can be assured that they will all be ethically sourced from managed forests. The timbers are first air dried then kiln dried to 8-10% moisture content before being manufactured into worktops in a quality modern factory. Silestone is a compound made up of 94% natural quartz, which make it extraordinarily hard and resilient. This is the one and only worktop made of quartz with anti-bacterial protection, giving it hygienic properties that are not to be found anywhere else on the market. It is an excellent surface for kitchen worktops, bathrooms, floors and wall cladding using the minimum number of joints. In addition, it comes in a variety of different shades of quartz colour, offering a number of decorative possibilities from a mere kitchen top to a project for a complete set of furniture. Silestone is an investment for the future. Silestone is forever. Our granite kitchen worktops are made to the highest UK standards and will sit on your kitchen cupboards, proud as the center piece of your new kitchen. With a wide range of colours and styles, we will be able to source the granite work surface you are looking for to compliment your kitchen design. Add splash backs and up stands to complete your look. Made from natural stone and cut from the finest granite, our granite worktops are extremely durable so can take a lot of punishment before they get damaged. If you are looking for stone worktops, then granite is the best choice as the final product provides that quality finish to your kitchen. 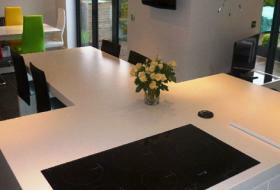 Corian seamless work surfaces are custom made to fit your home with a choice of nine great colours. Using the same precise fabrication process as the top solid surface brand, Offering a very durable quality product. Any length or width is possible and radius corners can be included without adding to the cost. 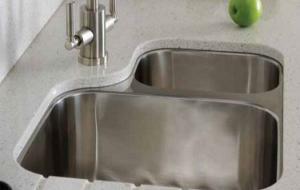 Seamless moulded sinks are available in three sizes and include drainer grooves. 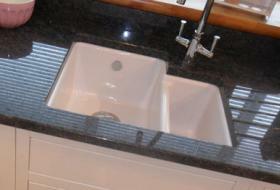 We can also undermount any sink including Belfast sinks. Designed to feel smooth and warm, solid work surfaces are easy to clean, non porous and unaffected by surface water. Together with upstands, backsplashes, and slab ends, solid work surfaces offer superb design, creativity and wonderful practicality. We guarantee that your solid worktops will be colour matched. Corian give a ten year warranty which gives peace of mind and, in the unlikely event of accidental damage can be repaired and re-polished in situ with minimal disruption.